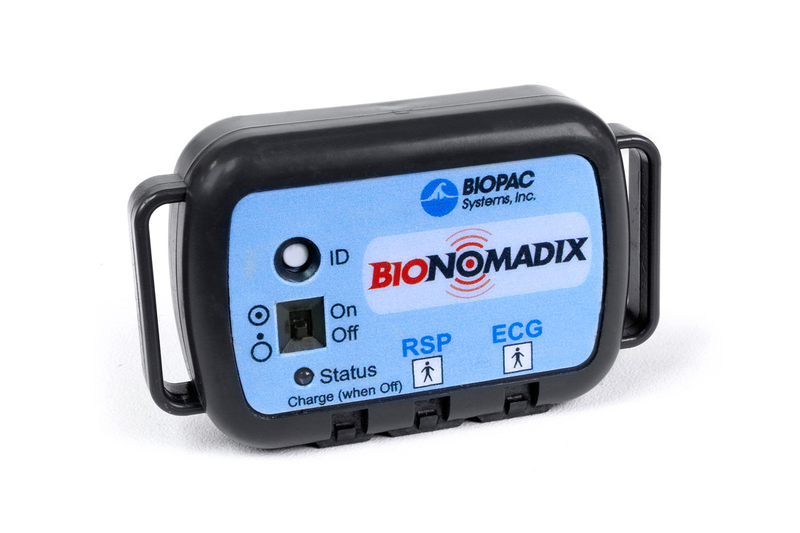 The Dual Wireless Respiration and ECG BioNomadix Transmitter is optimized for respiration and electrocardiogram data; record one or both signals with the Smart Center, Logger, or a matched Receiver. 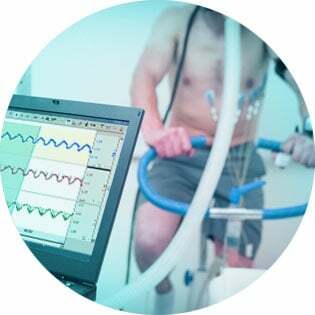 The high signal to noise ratio and high time-based sampling resolution permit the pair to be used for precise respiratory studies and exacting heart rate variability studies. 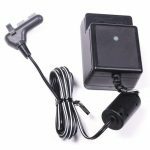 Physiological signal data is transmitted at a rate of 2,000 Hz, providing high resolution waveforms at the receiver module’s output. 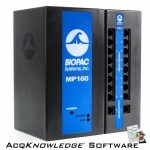 The largest ECG signal which can be measured is 10 mV P-P, the smallest is less than 1 µV rms. Raw ECG data is bandlimited from 0.05 Hz to 150 Hz, to provide a very high quality recording. Biopotential amplifier/transmitter signal to noise ratio is very high (in excess of 70 dB), as the noise floor for ECG signal transmission is only 0.9 µV rms (bandwidth 0.05-150 Hz). 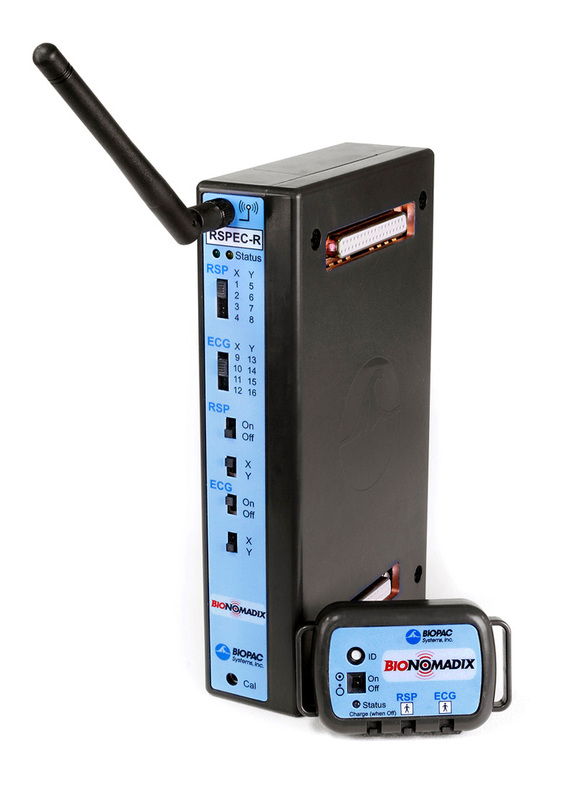 The module pair is designed to emulate a “wired” connection from subject computer, with all the benefits of a fully-wireless recording system. 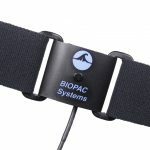 Specifically designed to measure respiration activity associated with circumferential changes in the thoracic or abdominal regions of the torso. 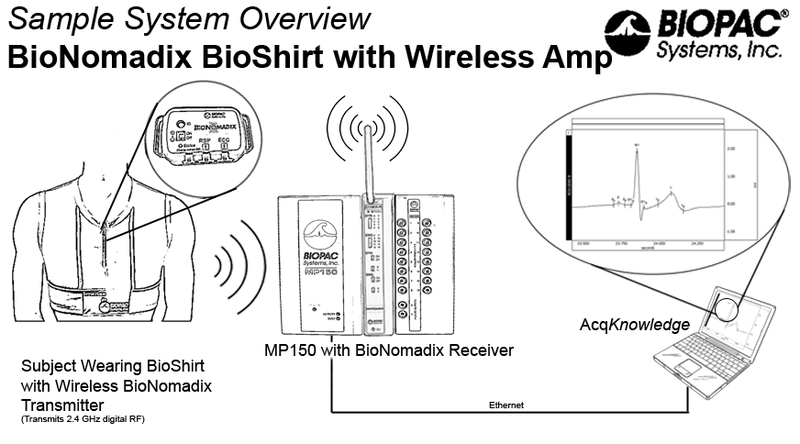 Attach the transmitter near or on the subject’s torso via the stretchy Velcro strap (included) or use the pocketed, stretch-mesh BioNomadix Shirt and connect the respiration transducer(s). As the subject inspires, the thoracic and/or abdominal circumference expand slightly, increasing the output signal level. As the subject expires, the circumference reduces, dropping the output signal level. Raw RSP data from the module pair is bandlimited from DC to 10 Hz, to provide for the measurement of relatively static respiratory conditions, such as cessation of breathing, up to the extremely rapid respiratory effort variations (up to 600 breaths per minute) associated with coughing or sneezing. 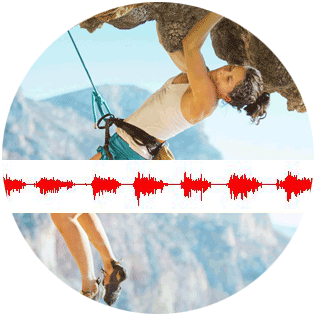 Additional internal highpass and lowpass optional filters provide for high quality amplification of respiratory effort signals even during periods of vigorous exercise or activity. 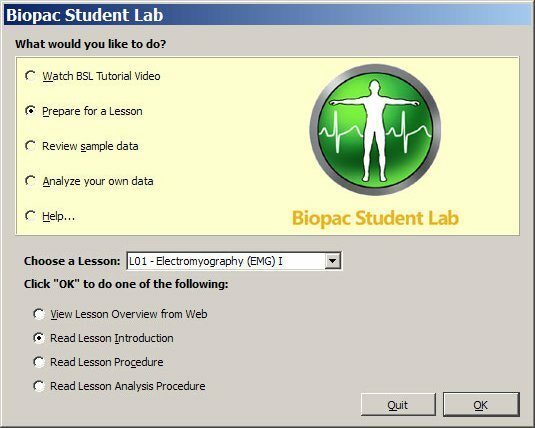 Use AcqKnowledge to evaluate the difference between thoracic and abdominal respiratory effort. 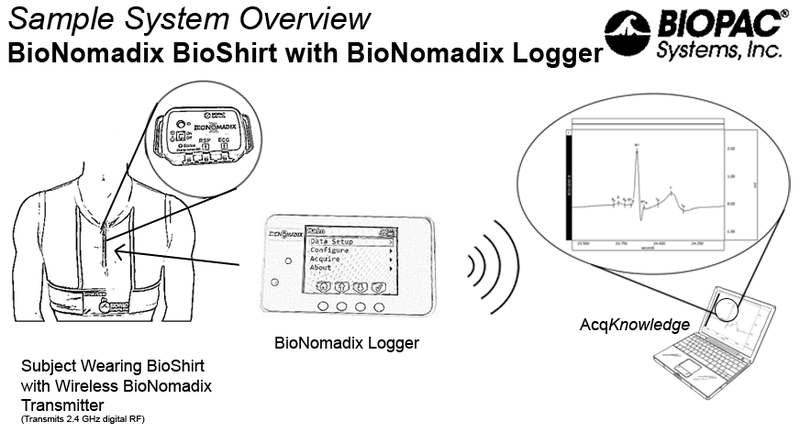 The respiratory effort transducer is sensitive enough to measure the circumferential change associated with each heart beat, so AcqKnowledge can be used to extract both heart rate BPM and breathing rate BPM from respiratory effort signals. 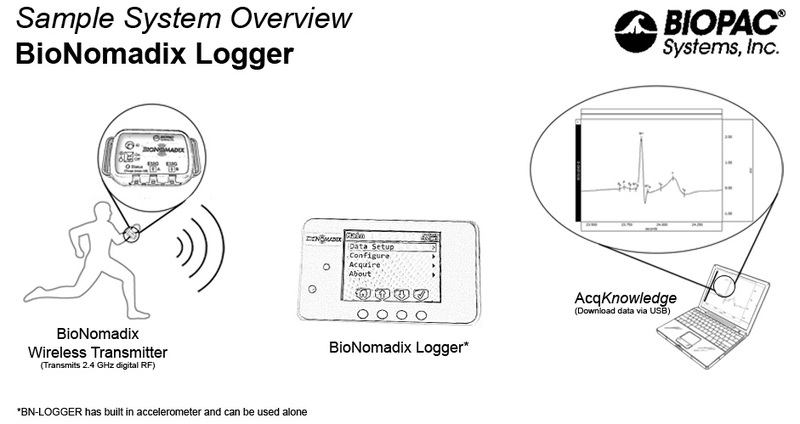 Using AcqKnowledge, both fast or slow response respiration data can be isolated to accommodate high quality signal component identification. 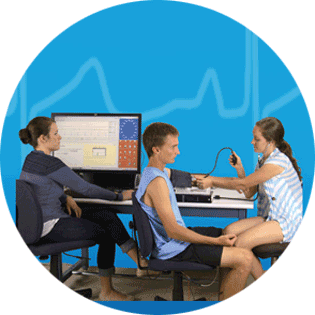 Respiratory measurement can also be synchronized to a specific stimulus for stimulus/response investigations, such as those associated with challenge and threat. 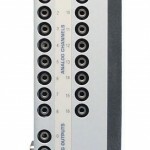 The module pair has a fixed gain of 2,000 for the ECG signal. 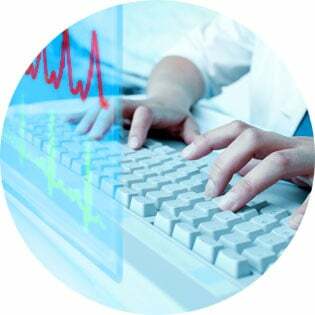 Using AcqKnowledge, wide bandwidth ECG data can be filtered to lower values to accommodate high quality ECG signal isolation even in the presence of extensive subject motion. 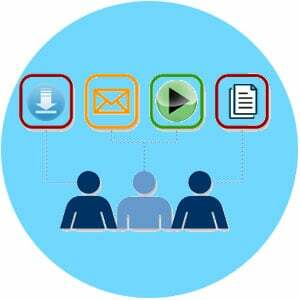 AcqKnowledge software automatically scores the data and extracts the measurements of interest on a cycle-by-cycle basis. The results are automatically exported to Excel or pasted in the Journal file. AcqKnowledge also includes a fully automated HRV analysis feature. 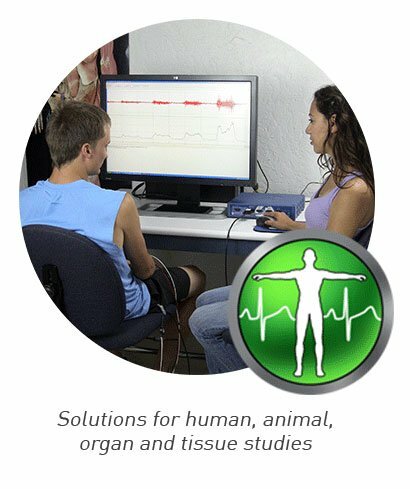 The HRV analysis provides values for VLF, LF, HF, VHF, sympathetic, and vagal, as well as the sympathetic / vagal balance. 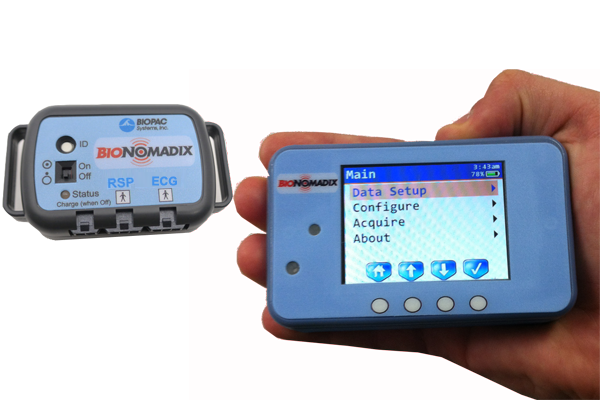 BioNomadix are configured for specific signal types, so you don’t have toadjust settings on the hardware or software for high quality data. 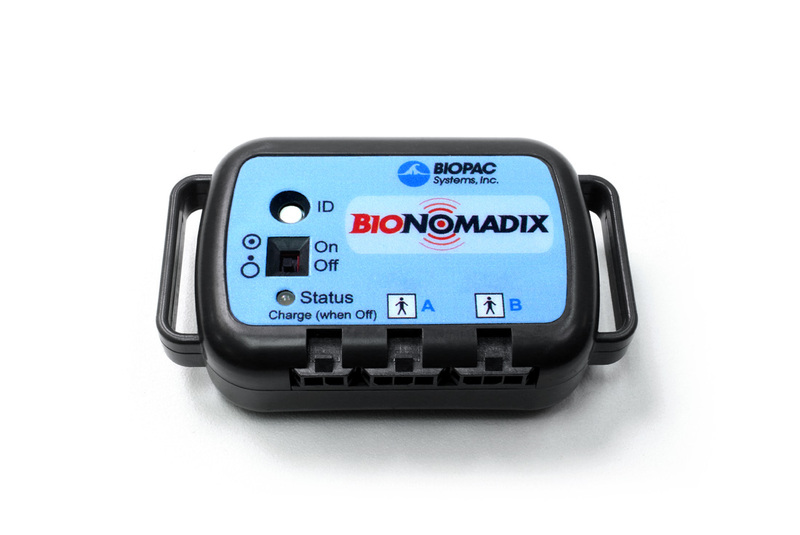 Multiple BioNomadix can be used to provide the optimum signal combination for a research study requiring biopotential measurements from multiple subjects or multiple locations.